I personally have always liked the early Assassins Creed games. 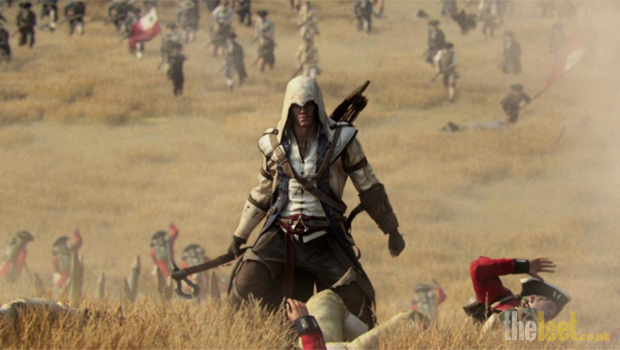 My enthusiasm began to wane somewhat with the release of Brotherhood and then Revelations, yet I still held a candle for the franchise and eagerly awaited the release of Assassins Creed 3 by Ubisoft. Assassins Creed fans will know Ezio is no more and that's fair enough. He had his moment and it's time to move on and we have indeed. In fact the franchise has now moved onto the seventeen hundreds, during the war of independence with the British, who are of course the bad guys. The game starts off with you playing as Haytham Kenway who really is a bit of a nasty piece of work. This for me dragged on for quite a while before we get to play as the main character Connor. 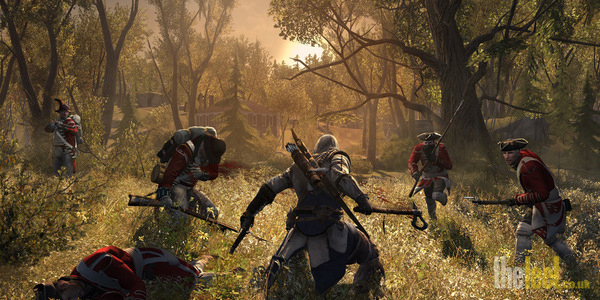 The main character Connor is a half Native American, half British who has a grudge against the Brits and is recruited into the assassin brotherhood to fight against the dreaded Templars. Now I am not going to divulge any spoilers for the story but there are a few surprises to come. Talking of which, this game has numerous amounts of cut scenes and seems to be more video than actual game. Fortunately you can skip these if you want; this as well as what seems like endless loading screens does drag it on a bit. The Native American dialogue, although trying to give the story some authenticity, just comes across as monotone and irritating. I mean come on, Native American are not all serious and unemotional. Then for no reason Connor starts talking English with an American accent without any explanation. The hunting and trapping sections is just down right boring. Fine, he's a native and he can track animals… do we care? 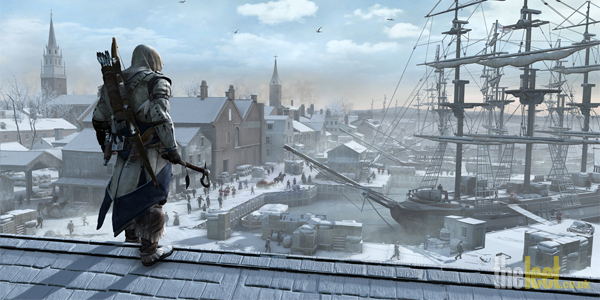 The other irritating element of Assassins Creed 3 is the constant travelling. I mean one minute you're in Boston or New York, the next its off somewhere else, then back again. In the original Assassins Creed, you had to achieve certain goals to open more parts of the city; in this game although the cities are beautifully rendered (the best yet) you never have enough time in them to enjoy it. To be honest Connor has all the charisma of a wooden wardrobe. He certainly hasn't the depth of Ezio and he is pretty one dimensional. Like his modern day descendant Desmond, both these characters have no appeal at all really. The actual graphics of Assassins Creed 3 are brilliant as usual, with beautiful rendered scenery and buildings as we have come to expect, and the new naval battle sequences are great and work really well. The combat mechanics have improved since the last game and are more about countering than attacking. It is impressive, yet can become boring after a while, especially the wilderness sections where you get to fight off all kinds of wild critters. Unfortunately this is not what it seems… instead of you being allowed to dispatch the animal your own way, you have no option but to hit the corresponding button when requested. Free running again plays a big part in Assassins Creed 3 with the introduction of tree free running; all very nice but not much of a challenge really. There are plenty of side missions to keep you busy and now, with the introduction of added objectives, this ups the challenge as you can return to try and beat these added objectives if you want. There's the usual looting of bodies and trading elements enabling you to purchase various upgrades and weapons etc. Another element that is often overlooked in Assassins Creed is the multiplayer part of the game. It's been tweaked with many new modes. To be frank this outing should have been the best one yet. OK the graphics are indeed the best so far yet the constant moving around and endless cut scenes spoiled it for me. Connor is no Ezio that's for sure! It just felt like the game was in control and not me. Assassins Creed fans will enjoy this as it is more or less the same formula as before, yet I came away from the experience with a feeling of something lacking. Assassins Creed has always had this great open world feel about it, yet somehow this version felt quite linear and constrained. Still, at the end of the day it's a great game; perhaps not as good as the earlier ones, but visually stunning, with good game mechanics and plenty of objectives and missions, perhaps too many cut scenes for my liking.